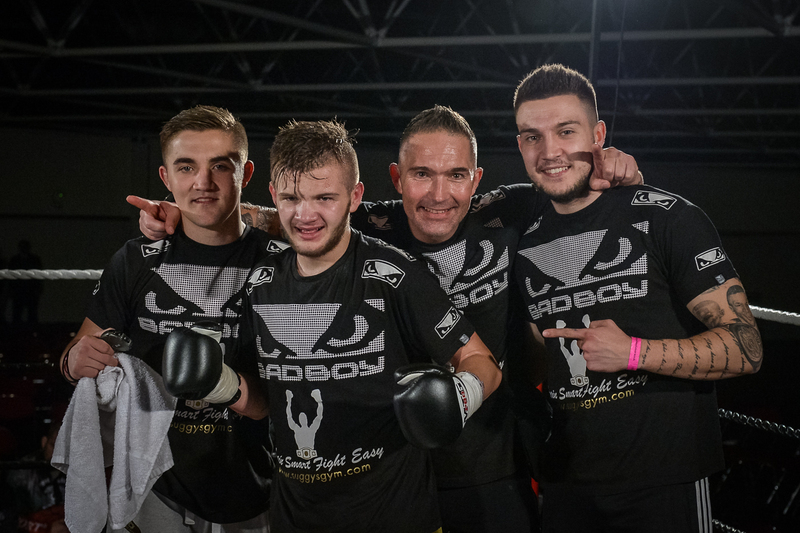 Bailey ‘BadBoy’ Sugden certainly started as he means to go on, with not just one but two decisive wins on Saturday 21 March, when he made his professional K-1 debut at the Harrow Leisure Centre. 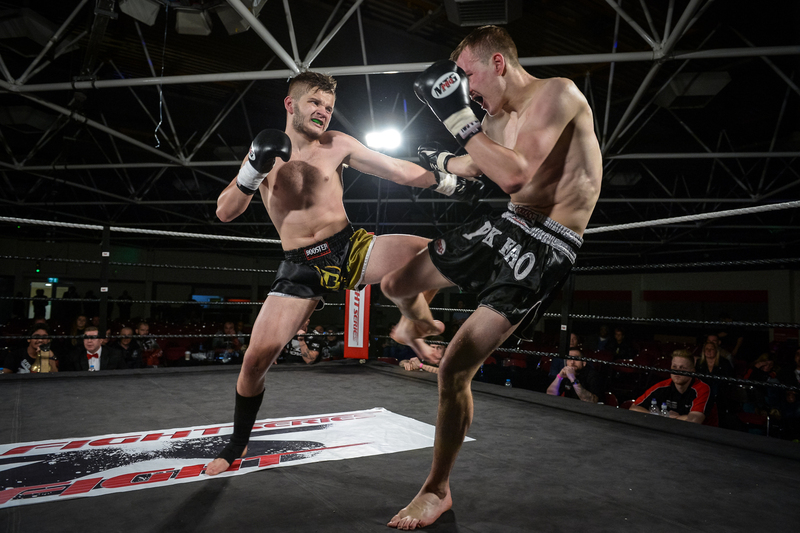 Defeating both of his opponents in the Future Stars League 63kg Four Man Tournament earned the Suggy’s Gym fighter a £1,000 purse and a place on the Superstars Fight League card at Wembley on 16 May. 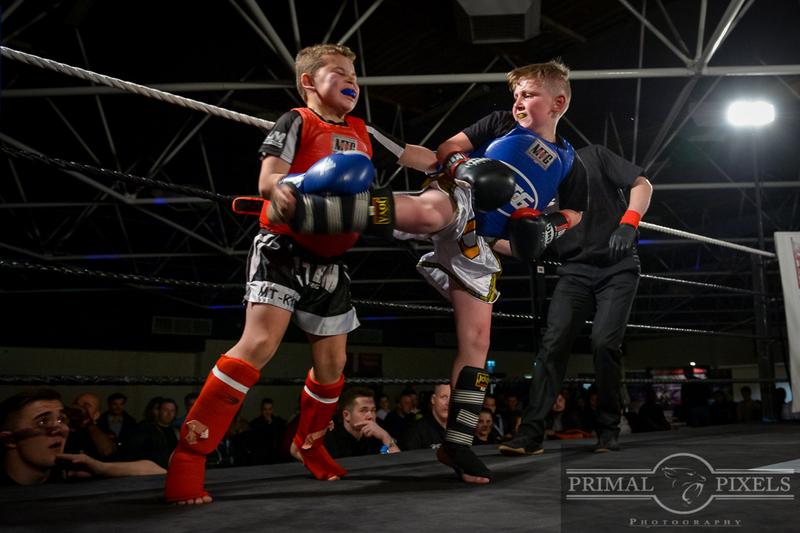 The Harrow event also featured 8 year-old Sam ‘Psycho’ Hardy from NMA Fitness Centre, who defeated local fighter Josh ‘The Tank’ Wilton over an action-packed three rounds on the undercard. 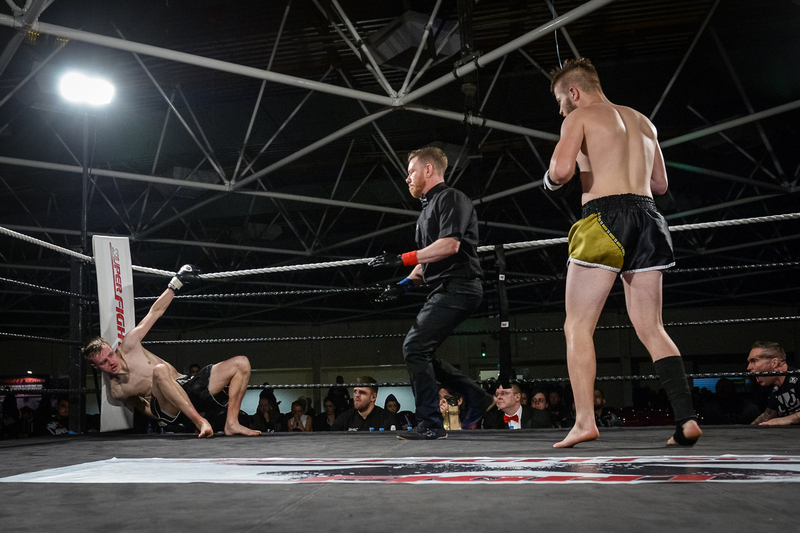 In his semi-final, 17 year-old Bailey was drawn against the very experienced Luke Portrainer from London’s Diabolo Gym, known for its solid boxing despite being a Muay Thai club. Although well aware of the success and achievements of Bailey’s brothers Chad and Regis, Luke could hardly have expected what he was about to be faced with from his younger opponent who showed a maturity beyond his years. After a big first round for Bailey, in which he went on the attack from the start with some eye-catching punches, low kicks and knees, the question was whether he could maintain the same discipline over the next two. But although Luke tried to take it to his opponent, Bailey moved it up another level, landing some big punches which appeared to hurt Luke while still following orders from the corner not to try and finish the fight, use unnecessary energy or risk getting caught be being reckless. It was a shut out and Bailey was declared the unanimous winner but even before the decision was announced, Luke and his trainers were already congratulating him on an excellent performance and victory. “What you do in between fights can be as important as what you do in the fights themselves,” said Suggy’s Gym head coach Dean Sugden. “So at this point all our attention was on getting Bailey wrapped up in the changing rooms, icing his bumps and bruises and making sure he was kept warm and calm until he was back in the ring. In a clash between the two youngest competitors in the tournament, Bailey attacked his 21 year-old opponent ferociously and with precision, catching him with a magnificent overhand right which sent Joe reeling to the canvas. The referee stepped in to begin the count but Joe recovered well and, with both a purse and a place on the Wembley card at stake, took it to Bailey. Bailey listened to his corner and, after a bit of a lull in the second round, came back out in the third determined to pile the pressure on his taller opponent with strong boxing. Despite the illegal use of the head from Joe in the clinch, Bailey remained calm and took a very well earned unanimous points victory. With all three sons now winning Eight and Four Man Tournaments at such young ages, Dean Sugden was an understandably proud coach and dad. 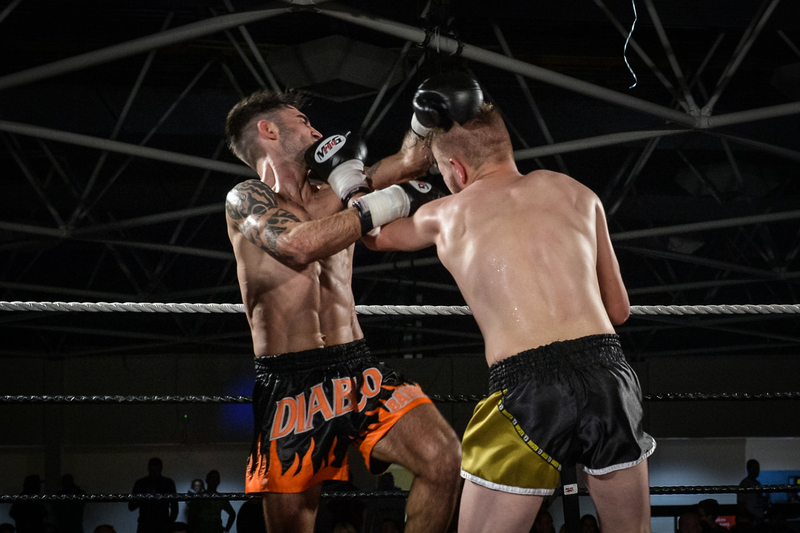 “It was also great to show other kickboxers how to beat Thai fighters on a night where experienced kickboxer Mikey Worswick was stopped in the other Four Man Tournament by Marcus Powell,” he said. “Suggy’s Gym has been getting a lot of media attention recently, as a result of the success Chad and Regis have had on leading promotions both at home and overseas. The youngest Sugden son now joins his two older brothers and his cousin Fergus Taylor in the Suggy’s Gym stable of professionals. Already looking forward to his next outing, when he makes his first pro appearance in front of a home crowd on Saturday 11 April, he said: “Being thrown in at the deep end is a bit of a Sugden family tradition and Saturday night was no exception – not just my pro debut but a four man tournament that had attracted some very experienced fighters. “And this is just the beginning for me. Next month, I’m up against another opponent unbeaten under K-1 rules when I fight Vinny Baldwin on our home show at The Magnus Sports Centre and then I’ll be on the road to Wembley in May.